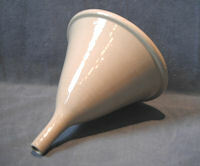 Original, quality, large, glazed, buff coloured stoneware funnel in mint condition, circa 1900 / 1920's. Originally used in a swimming pool situation. Complete and in good and working order. 9.5" diameter x 10.5" tall. Another matching, but larger funnel may well be available. 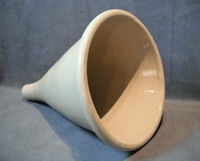 Original, quality, large, glazed, buff coloured stoneware funnel in mint condition, circa 1900 / 1920's. Originally used in a swimming pool situation. Complete and in good and working order. 11.5" diameter x 13.5" tall. Another matching, but smaller funnel may well be available. Click opn photo for larger and other views. 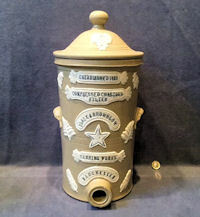 Original, quality late 19th century buff coloured stoneware water filter with the original lid and tap and white ceramic applied decoration. The applied decoration has firing cracks in many places but no actual decoration is missing and details "Lipscombe & Co Patentees, 45 Queen Victoria Street London" in black text. The stoneware tap is impressed "Doulton Lambeth" and is perfect but the lid has some chips and one chunk has been glued back on it. The inner filter section is missing, but otherwise all is complete albeit with minor faults as described. 15.5" tall and base 6.5" diam. 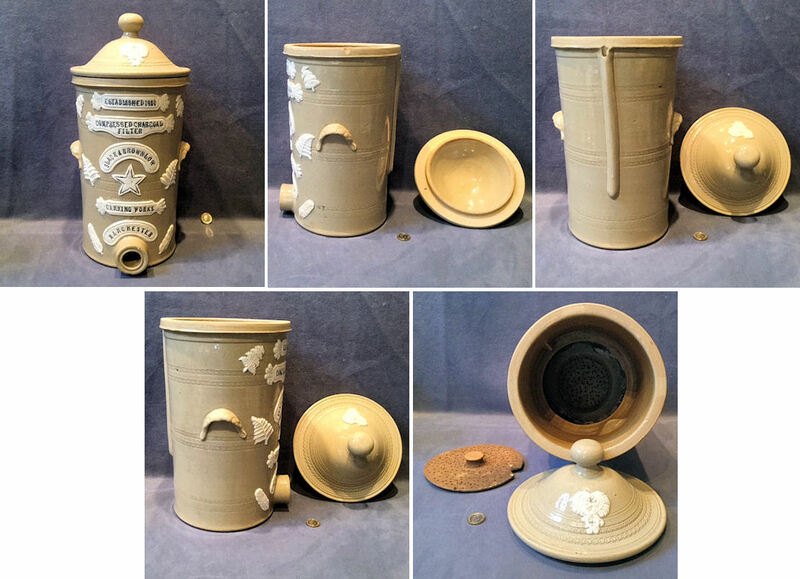 Original, quality late 19th century glazed stoneware water filter with side handles, the original lid and applied white ceramic decoration of banner shaped mounts, fern leaves and feathers. The banner mounts are impressed with the detail of the manufacturer "Slack & Brownlow Canning Works, Manchester, Established 1880 and Compressed Charcoal Filter". Two tiny rim chips, not visible when lid is on and requiring a tap to the front, otherwise all is complete and in good order and probably would still work. A charming very small example. 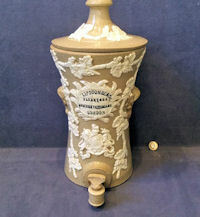 17" tall including lid, 8" body diam and 9" front to back including tap aperture.